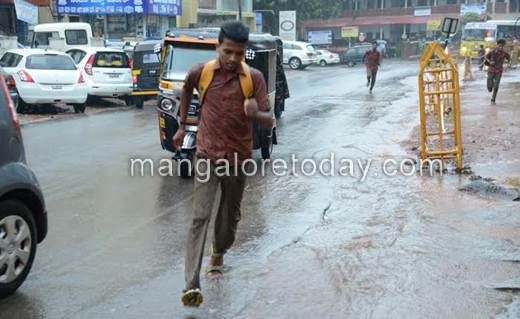 Mangaluru, June 4, 2015: As expected monsoons have arrived in the city on June 4, Thursday. A gloomy weather had prevailed since morning. By afternoon, thick clouds emerged and soon there were heavy rains accompanied by thunder and lightning. 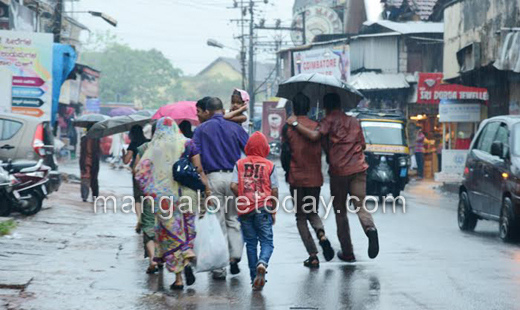 It was a common sight to see people on the roads without any umbrellas rushing for cover, while many just enjoyed the rain that provided a much needed reprieve from the scorching sun. According to Meteorological Department sources, rains will continue for the next five days. However, monsoon will make its full presence on June , say weather forecasters. 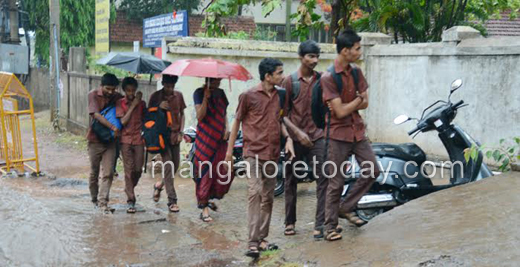 Other places which too experienced heavy showers are Dharmasthala (52.4 mm), Moodbidri (9.2 mm) Puttur (3.8 mm), Shiradi (50.8 mm), Bhatkal (18.6 mm), Udupi (3.6 mm), Karkala (0.8 mm), Siddapura (0.6 mm), Sullia (3.4 mm) and Maani (4.6 mm).